Also known to a friend as Jewell Cake, named after her mother, this cake is a tower of moist cake layers with icing and is no easy feat to take on! However, this recipe helps simplify it a bit! Preheat oven to 350 degrees F (175 degrees C). Grease and flour 5 8-inch cake pans, and line them with parchment paper. Whisk together the cake mix, baking powder, flour, and sugar in a large mixing bowl. With an electric mixer, beat the mixture with water, vegetable oil, and egg whites at low speed until thoroughly mixed; increase speed to medium, and beat 2 minutes. Scoop 1 cup of batter into each of the 5 prepared cake pans. Bake in the preheated oven until cakes are set in the middle, about 8 minutes; watch carefully so the thin cakes don’t burn. Cool in pans for 10 minutes, then remove to wire racks to finish cooling. Whisk the chocolate pudding mix with 2 cups of milk in a bowl until thoroughly blended; let stand 2 minutes to thicken. 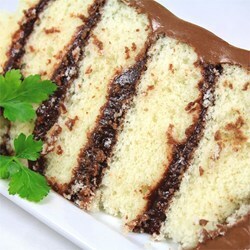 Place a cake layer on a serving dish, and spread with about 1/2 cup of pudding; repeat with remaining layers and pudding, ending with a cake layer. In a bowl, mash the cream cheese and butter together until thoroughly combined; mix in confectioners’ sugar, cocoa powder, vanilla extract, and milk, slowly adding and mixing in milk as needed to make a spreadable frosting. Ice the top and sides of the cake with the frosting. Refrigerate leftovers.